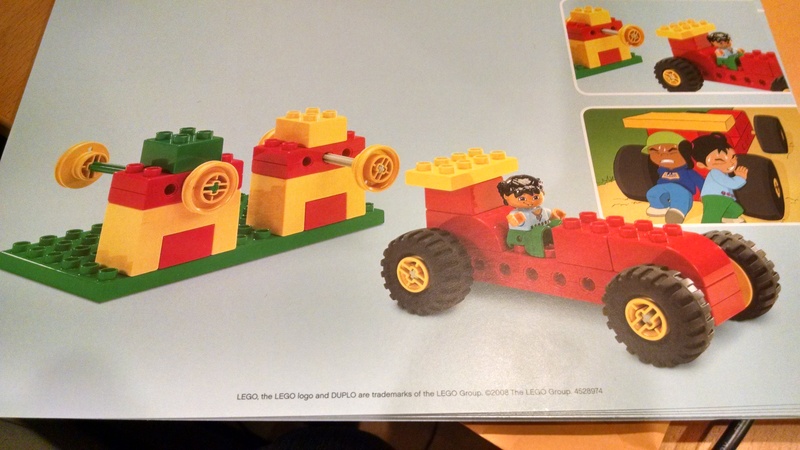 There are 102 Duplos, including some unique specialty pieces, plus eight instruction cards with visual instruction for how to assemble 8 machines. The set is rated as appropriate for ages 5 and up. 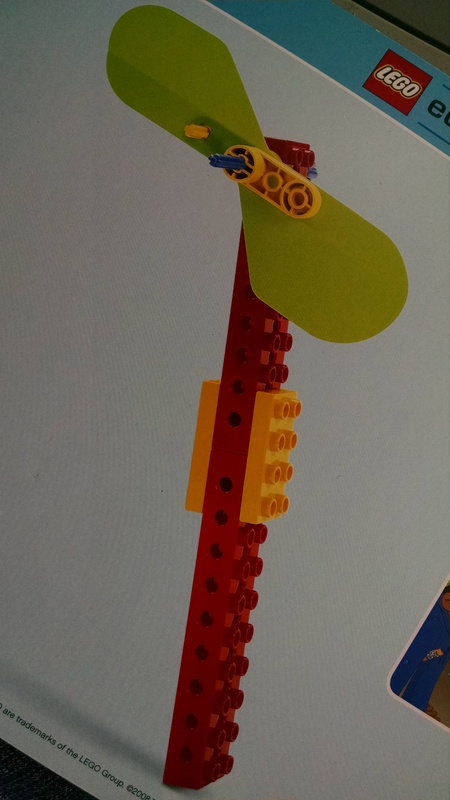 I think 4 and up would do fine if the child has prior experience with Duplos and Legos, and with STEM concepts. 8 sequential lessons. Whether in a classroom setting, or using these at home with your child, you can start with project #1 and work your way through to project #8, following the directions. You could use the teacher’s guide, walking kids through the story, constructing, testing with the worksheets, and continuing on with additional work. After completing the full curriculum, then the materials could be left out for free play and exploration. Occasional classroom activity. For our inventors class, I plan to put these projects out one at a time, as they tie into the theme of the week. The project will be one of many activity stations in the room that the children can rotate to independently. I will put out the instructions card, then put all the materials they need for the project in one basket, and some extra Duplos nearby in case they want to tinker / add to the project after they’ve completed it. I will typically not use the activities and materials in the teachers’ guide, except occasionally the worksheets or the questions that extend learning. #1 is a pinwheel, which spins when you blow on it. We’ll add it to our Wind theme class. Project #2 involves building a top launcher, where you turn the crank, which spins the gears to wind up the top, then you release the top which spins and spins. 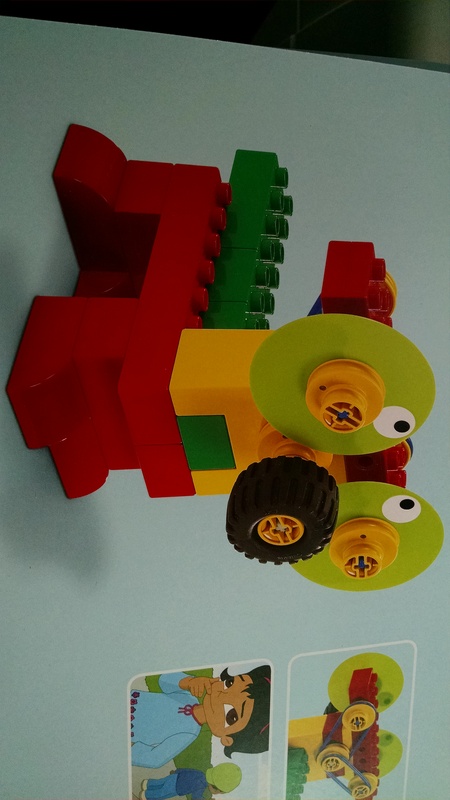 This is actually a VERY cool Duplo set, and “worth the price of admission.” We’ll add it to our week where we talk about wheels and axles. Note: although the instructions don’t tell you this, I think it would be fun to first have children build the top, and try spinning it with their hands to see how long it will spin, and then make the launcher and test again. 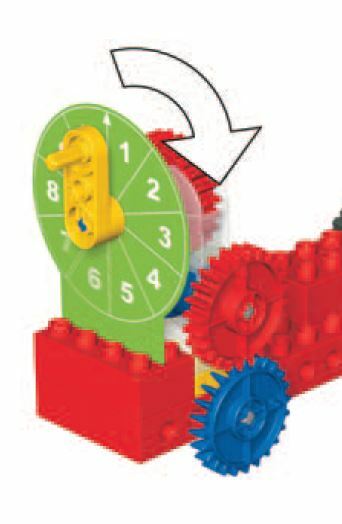 Helps them really understand the power of the gears to increase spin. #3 is a seesaw. 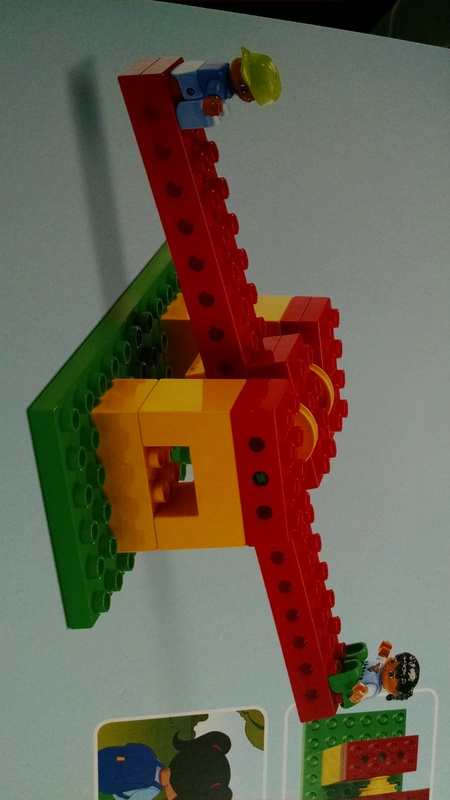 It’s fun because you can move the Duplo people back and forth to balance them, or you can try adding other Duplo loads and finding the balance point – it’s overall a helpful lever to add to our Levers class for fun exploration. #4 is a raft. After my 5 year old and I built it, I was curious whether it would float or not. We talked about what he knew about what sinks and what floats: It was broad and flat, and he knows that’s a shape that tends to float well. It had a solid bottom – he knows you want to avoid holes in the bottom of a boat that would cause it to take on water and sink. Legos are pretty light, he thought, but are they light enough? He couldn’t decide if it would float or not. I predicted it would. His dad predicted it wouldn’t – he didn’t think it could capture enough air underneath it to float. It turns out it could, and it did float. So, we decided ten and there that this project will be saved till our Sink and Float class, where we’ll ask our students to make the same assessments and predictions. Ironically, after we did all this, we read the teacher’s guide. 🙂 Turns out the “contemplate” experiment has you float the boat on water, and then blow into the sail to see how fast it will travel with a small sail or a large one. The Connect story in the teacher’s guide is that Sam and Sara love racing their car down the hill, but hate the hard work of pushing it back up the hill again. 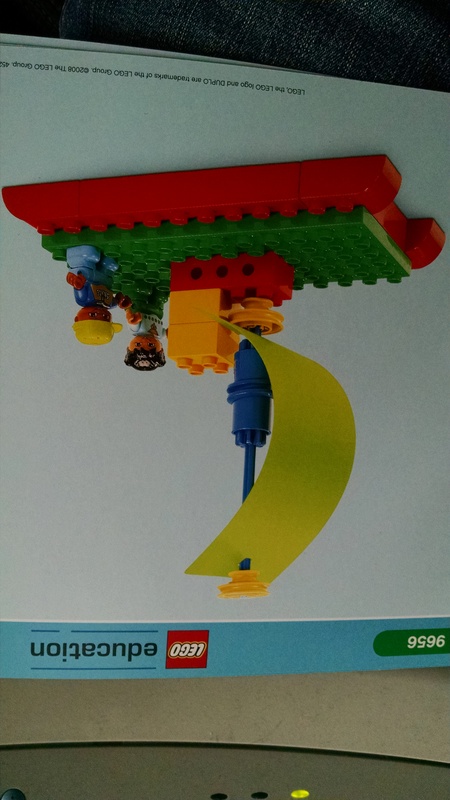 In the Construct part of the teacher’s guide, you build the car, two launchers, and the ramp (by propping a board on a stack of books or blocks.) In the Contemplate section, you test whether the small launcher or the big launcher is better at getting the car back up the ramp. The Continue section is about competing for accuracy… who can launch the car so it reaches a target but doesn’t overshoot it. We will use this in our Cars week, which follows the wheels and axles unit. We will likely include the Connect story in class, because it illustrates nicely how a simple machine reduces the human work required. #7 is a hockey playing robot. You turn a gear on his back, and he swings his stick at a block. We’ll add him to our Robot week. #8 is a goofy dog whose eyes spin. 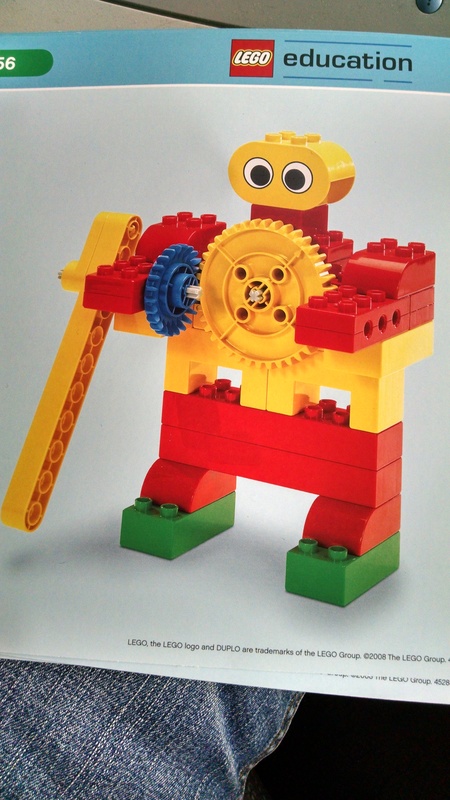 We’ll add him to our Contraptions week, which is late in our Engineering / Simple Machines unit. 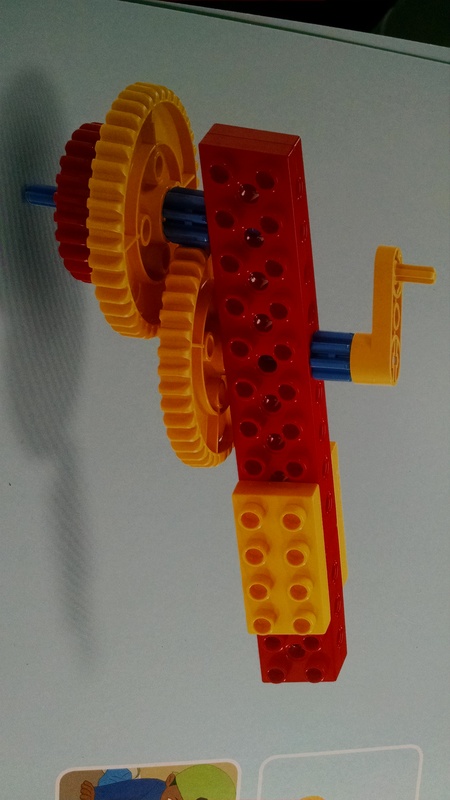 I’ll have just his materials out during Discovery time at the beginning of class, but in tinkering time, I’ll probably make lots more of the supplies from this Simple Machines kit out so children can incorporate them into contraptions. 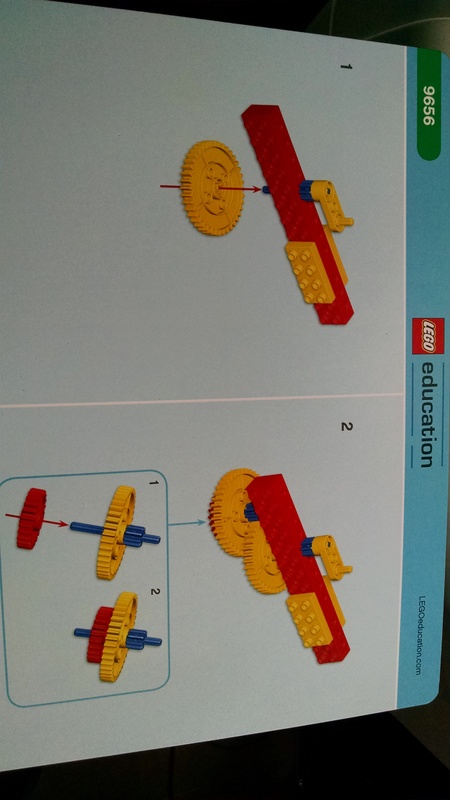 Note: This is called a Simple Machines kit, so I was expecting a little closer tie-in to the concept of the 6 Simple Machines. Perhaps one project to illustrate each machine, then a couple that blend them together. The seesaw does this for the lever, and several of them are about wheels and axles. Those cars are tested on an inclined plane, but the curriculum doesn’t talk about this as a simple machine idea. 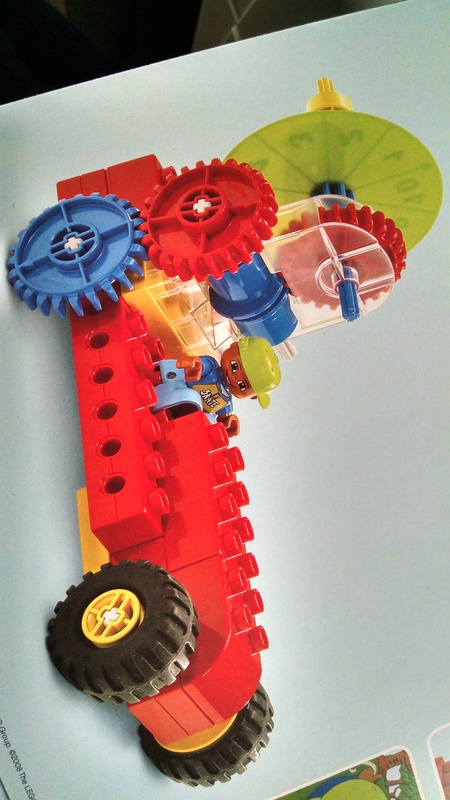 I’m not sure what Duplo project would tie into screws or wedges, so am not surprised those aren’t represented, but I would have expected something including a pulley. This isn’t a complaint, per se. I really like the projects that they did include, but want to be sure that others are aware of what they are / aren’t getting.